Can Jews and Arabs coexist — inside Israel? The statement above — which was misquoted in the English edition of Benny Morris’ book The Birth of the Palestinian Refugee Problem, 1947-1949 to precisely reverse its meaning — has more or less characterized the approach of the state of Israel to its Arab minority since Israel’s founding. Unfortunately, it seems, more and more, that that minority doesn’t agree that there is room for both peoples. Stick in your throat like a piece of glass … . Tawfiq al-Khatib of the Islamic Movement, a fundamentalist Muslim organization, represents another stream in Israeli Arab thought that negates Jewish nationalism. Also a member of parliament, Khatib stated (in Hebrew) during a religious dialogue with Israeli Jews, that “there is a precedent for Muslims accepting non-Muslim rule. But in Palestine, the Holy Land? Only Muslims can rule here.” Then how, he was asked by another dialogue participant, could he take an oath to uphold the state and sit in the Israeli parliament? Khatib replied that “there is a verse in the Qur‘an which states that God doesn’t place impossible burdens on the believer. If all the Jews moved to Uganda, my problem would be solved. But it’s not going to happen. So I have to take care of the million Arabs who’ve been given Israeli citizenship.” Asked about his long-term solution, Khatib called for a treaty of non-belligerency between Muslims and Jews, renewed every ten years, presumably an allusion to the Prophet Muhammad’s Treaty of Hudaybiya [a ten-year truce with the Quraysh tribe that Mohammad abrogated, and then massacred the Quraysh – ed.]. These two streams of thought — the nationalist and Islamist ideas — have only grown stronger since then. Both Palestinian nationalism and Islamism provide a different answer to this question than Zionism does. In 2007, Israeli Arab intellectuals and “political activists” published a manifesto called the Haifa declaration. In essence, it demanded that Israel be transformed into a binational state, and the Arab refugees be granted a right of return. It described Israel as a colonialist power, presented a historical narrative based on Arab victimhood, and celebrated incidents of violent conflict between Israel and its Arab citizens. Its implementation would mark the end of the Jewish state as well as a rejection of the Zionist idea. The Carmel fire — which preliminary reports say may have been caused by ‘negligence’ by Arab teenagers — gave rise to numerous arson attempts which succeeded in starting several subsidiary fires. Officials say that arson by Israeli Arabs is common and has been a problem for years. One of the lessons of the fire is that problems that are swept under the rug, like the lack of funding for the pitifully inadequate fire service, can result in large disasters. The problem of the attitudes of the Arabs inside Israel has also been swept under the rug. It’s possible that there is no ‘liberal’ solution to it. It’s possible that Ben-Gurion was wrong. This conclusion is extremely disquieting. But the fact that the consequences of a proposition are bad does not imply that it isn’t true. Those who insist that the present trend can be reversed and that coexistence is possible need to present a scenario in which nationalist and Islamist attitudes are likely to become weaker rather than stronger over time. I don’t see one. Update [5 Dec 1416 PST]: Corrected reference to the treaty of Hudaybiya. This entry was posted on Saturday, December 4th, 2010 at 4:24 pm and is filed under General. You can follow any responses to this entry through the RSS 2.0 feed. Both comments and pings are currently closed. It is more and more clear that the ‘logical answer’ to the problem of growing anti- Israel sentiment within its Arab minority population is seen as politically impossible. The ‘two- state solution’ with population transfers which makes most ‘pragmatic sense’ for Israeli Jews is a non- starter diplomatically. Even Prime Minister Netanyahu has not adopted Leiberman’s ideas in this. It is also clear that improving the social conditions and economic opportunities of the Arab minority (Something which has been done considerably since the founding of the State) will not make this population more ready to see itself as a loyal minority within a Jewish state. Why should they after all? They are the great majority in the region. The world encourages them to believe that they are always being wronged, and have ‘rights’ they are not getting. There is a Left- Wing influential minority which shares their anti- Zionist ideology. Israel does not have a simple or great choice. It cannot rule the minds and hearts of this minority but it must take severe action against any anti- State action. 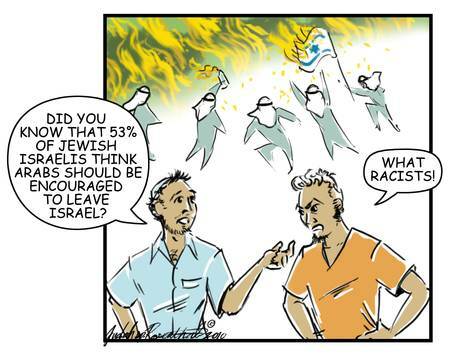 The Arab minority will never be happy in a Jewish state. But the Jewish majority has only one historical homeland, one Jewish state . And it must continue to maintain and develop it despite the unhappiness of the minority population.